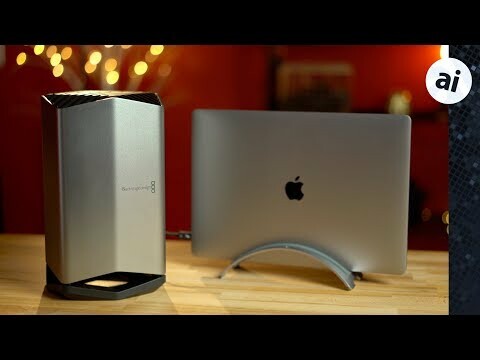 The Blackmagic eGPU, built in cooperation with Apple, might seem pricey at $699, but it comes packing a Radeon Pro 580 GPU, the same chip that comes in the top-spec 2017 5K iMac. By itself, the silicon is worth just under $300, and you can now get it bundled with some other eGPU's for around $500. For one, the Blackmagic is the first eGPU to support Thunderbolt 3 and USB-C monitors like LG's 4K and 5K UltraFine displays, meaning well-heeled MacBook Pro owners can turn their portable rig into something closer to a desktop. If you don't have or don't plan on buying an LG UltraFine display, the Blackmagic also works with any USB-C or HDMI monitor. DisplayPort screens are also supported with the help of a separate adapter. From a design standpoint, it's undoubtedly the best-looking eGPU we've ever seen, and it's built with high-quality materials. It's incredibly quiet, even at full load, a major upgrade from competing hardware that gets increasingly loud as operating temperatures heat up. In fact, the Blackmagic is so quiet that we forgot it was on while playing a demanding session of Fortnite at 5K resolutions. The eGPU drastically improved the gaming performance of a base model 2018 13-inch MacBook Pro with Touch Bar. With the MacBook's internal Intel Iris Plus Graphics 655 running at maxed-out resolution and high video quality settings, we were able to achieve around 15 frames per second while playing Fortnite. Those speeds dropped down to 7fps at times and the laptop's fans were on full blast. Connecting the Blackmagic eGPU and LG's 5K display, we set the game's resolution to 5K, or 5,120-by-2,880 pixels. Graphics quality (obviously) improved and frame rates were hovering at around 30fps. Unlike the MacBook Pro's integrated graphics chip, the eGPU was able to keep things much more consistent, with no frame drops that ruined gameplay. We also hooked it up to a regular 4K display using a Thunderbolt 3-to-DisplayPort cable and saw around the same 35fps at 4K "Epic" settings. If you're a photo editor, an eGPU won't really make a difference, since apps like Adobe Photoshop and Lightroom mostly rely on Mac's CPU for heavy lifting. We were hoping to see an improvement while editing 42MP RAW images in Lightroom, but the lag is still there despite some assistance from the eGPU. Video editing, however, is a different story. In Final Cut Pro X, the Blackmagic eGPU allows the 13-inch MacBook Pro to export a five minute 4K h.264 clip with added effects in less than half the time of the integrated GPU. That puts the smaller MacBook Pro's performance nearly on par with the base 15-inch MacBook Pro. Interestingly, in some cases the 15-inch MacBook Pro gets slower when using the eGPU. Stabilizing a 4K clip on the 13-inch with eGPU was basically just as fast as the base 15-inch MacBook Pro, both with and without the eGPU. To our surprise, the 13-inch MacBook Pro with the eGPU was faster in the Bruce X 5K benchmark, finishing almost three times faster than the 15-inch MacBook Pro's discrete GPU. Geekbench 4's OpenCL test shows us the raw graphics performance of each GPU, and as you can see, it's a massive improvement over the 15-inch MacBook Pro's GPU. Overall, the Blackmagic eGPU is a specialty product that makes a lot of sense for a smaller group of people. It's more expensive than other solutions using the same GPU, and it's not upgradable. If you need Thunderbolt 3 support and would like a near silent experience, however, there's nothing else like it. Blackmagic's eGPU sells for $699 and is available through the company's website and Apple.com. Thanks for the review AI! I have 2016 maxed out 13" MBP and an LG UltraFine 5K monitor. Adding the BlackMagic inline to the 5K been a game changer for my casual video editing and World of Warcraft sessions (neither is work, but therapy ). I do notice even OS animations (screen switching, screensavers, etc.) on the 5K are much more fluid with the BlackMagic hooked inline to it. Thanks for the input! It's nice to know that the dual-core 13" gained a lot from it as well. We have one but didn't have the time to test it. I still can't get over the fact that you cannot instill a different graphics card down the road should you want to. To me, this is a huge drawback, especially considering you get a no so great graphics card in it to begin with. Sure, its better than the Intel graphics, but what isn't? I guess we'll see if this product gets updates going forward....if not, then I think its a poor purchase. Yeah, if you don't care about quiet, then other options are not only cheaper, but better for future expandability. But, if you do... so far, this is the only option. I'd like to see if others follow suit with something similar to this, but with an expandable chassis tray or something. Don’t think of it as an PCI breakout box. Think of it as an external GPU, much in the same way as an external hard drive. Not many people are complaining about not being able to reuse the hard drive enclosure - RAID ones excepted - that came with their external hard drive. They’ll just buy a new external hard drive. Two, three years down the road, these Blackmagic eGPU buyers will just buy a new eGPU box. Strange that they don’t offer a Vega version, but maybe being quiet was the number 1 priority and went with a lower performing, but cooler Polaris GPU, or whatever version it is using. I do wonder that Apple is using macOS eGPU support as a testing and seeding ground for how the 2019 Mac Pro will work though. A 600 W 2 GPU box is coming for the Mac Pro? I hope so... though if so, quickly before I buy one. While this design might be somewhat optimal for cooling (i.e. : vertical air-flow up a 'cylinder'), I don't see why some of the systems have to be so noisy, aside from the built-in GPU fans. If you kept it cool enough, would the GPU fans run fast? And, it seems for a few card options, you could create a kit-option that would replace stock fans on the GPUs with more quiet ones and include that with the enclosure. A bit more DIY, but I think the audience for that would be comfortable with it. Exactly... this is a done solution, out of the box, and is priced higher, accordingly. That's OK with the only real downside - for what it is - being how quickly it will become obsolete and rather worthless. And, yes, there are storage options, especially the fast SSD ones, that are pretty much what they are. Or, like you say, a lot of people who buy external hard drives don't open them and update the drive inside. That said, pros and GPUs are probably one of the biggest areas people would upgrade. And, yes, it would be nice if it were kind of a best-in-class kind of card in there from the get-go. I'd imagine they would still be able to cool it similarly, though maybe a big bigger enclosure or something, or possibly slightly more noisy. I'm guessing you're right on the Mac Pro (as others like Mike W have been indicating). It will probably be a core box with as many TB3 (or 4?) ports on it as possible and maybe a line of eGPUs, storage, and other add-ons. That might be OK now, whereas it really wasn't in 2013. I just hope for better OS support. It is silly they don't support more cards, and in Bootcamp, etc.... or even TB2. All tech devices become obsolete within a couple of years. If buying this eGPU gives you the performance you need to do your professional work, it'll be completely fine until your workload increases by a large amount. Just because newer graphics cards will come out, doesn't mean this eGPU with the 580 chip will stop being able to get the job. You'll just have that feeling that it could be done faster if you upgrade. 1. Rather obviously, being quiet was a high priority for this particular collaboration, and the Blackmagic meets the goal of significantly improving your video card while not deafening you in the process. People who don't care about quiet don't care about Macs, I tend to find, so they'll buy a far noisier box that better meets their needs. I don't think future editions of this will significantly up the game either, because quiet is always going to be one of the top priorities. This is clearly designed as a "sweet spot" option in terms of noise, price, and performance. Going bigger/better/noisier would have cost a lot more. 2. 98 percent of even the maybe 10 percent of MBP buyers who actually need/want an eGPU at all will be perfectly happy with this, and it will continue to perform well for them for the entire life of their use of the 2018 MBP. This is why it comes with a great hub and works so well with monitors -- the number of people who are actually rendering the next Pixar-type movie in their spare room or doing something that absolutely requires the fastest/loudest/most-power-sucking card the universe presently has to offer and nothing less will do ... is a far, far smaller market than I think most tech-site readers would imagine it to be, particularly before we get into how much $$$ such a solution would cost you. That's the realm of the dedicated workstations, not a notebook. Professionals, for whom time = money, are exactly those who will spend the money to put in the faster card when it comes out. Which again puts this in a bit of an different market than it seems to being pushed at (hence the questioning and pushback, IMO). What you guys are talking about is most the prosumer, or the professional user of such products who just needs enough power to work on the stuff, but isn't caring about a 8% or whatever performance gain. And, that gets us back to the whole pro argument. Wouldn't that 98 percent you're talking about, Charles, also be just as happy with a TB3 MacBook Air with this eGPU? If most of Apple's pro market isn't pro anymore (in the traditional sense of the application of that term to product-lines), then of course pushing the boundaries of performance also isn't a huge concern, I guess. It's a lot better to have all the expansion cards in separate enclosures with cables instead of mounting them all together inside the main chassis. No screwdriver needed! Anybody can use them. Don't care for gaming but this is my dream setup for work. Just gotta wait for Autodesk to port the Inventor suite over to Mac and I can finally rid myself of Windows. They might have prioritised quietness so it could be used in an office environment. So if I'm not mistaking other eGPU makers don't cram a bunch of USB ports on their boxes because these things eat at your bandwidth. To get the best performance you need all 4 lanes dedicated to your GPU....right? A number of them do, but you're right that it shares bandwidth on an already constrained connection. Typically, though, most of my USB connected devices aren't using a ton of bandwidth. And, when they are/will-be, I'd take that into account or connect them to one of the other ports directly. For example, if I had a RAID or really high-performance storage device, I'd connect that on its own. A good point and a good thing to keep in mind, though. Also, afaik, the GPU isn't constantly using the entire bandwidth of the connection. It might periodically do so when doing the most demanding things (graphics-wise). It would be interesting to know what percent of the bandwidth is being used under different circumstances (i.e. : just driving a 4k monitor, a 5k monitor, running a game, editing a video, etc.). Conspicuously missing from the Blackmagic is eGPU DisplayPort connectivity. It’s pretty clear that Apple and Blackmagic are aiming this eGPU at professional users with the ideal MacBook Pro + LG UltraFine 5K setups. While not DisplayPort, there are a pile of HDMI ports on it. I finally saw one of these at the Blackmagic booth at Siggraph last week. It's a LOT bigger than I thought, even having seen all these pictures. But even under load, it was practically silent... or at least as far as I could tell putting my ear to the top and given I was on an exhibition floor. I'm having a hard time seeing myself wanting something much bigger and louder based on what everyone says about the other eGPU boxes out there. So, yeah, there's a market for this. Yeah, I suppose it's a bit hard to tell on an exhibition floor. But all the reports say it is really, really quiet. I hope all the testers aren't on exhibition floors or super noisy studios, etc. I'm more looking for something I'm not going to hear on the podcast/video I'm recording in a condenser mic. So, I suppose everyone has their level of what noisy is. I also can't stand those little fans in PC laptops. My wife has one she brings home from work and it's always spinning up and down and annoys the heck out of me. I like a really quite work-space, and if there is going to be noise, I'd rather have it be some music. But, I agree, there is absolutely a place for this kind of thing. I'm a bit surprised it isn't bigger, in fact (the market, not the unit). Hopefully other units will take note and we'll get some competition in terms of the GPU used and good/better designs.